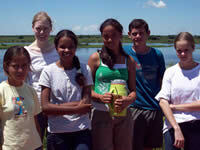 Top: Tracie Long (second from left), Diploma student in 2007-2008, during her visit to the Paraguayan Pantanal as part of the course. 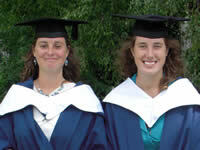 Above: Fiona Duncan and Jo Keene, Diploma graduates in 2009. 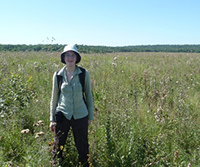 As WLT enter the third year of running a Graduate Diploma in Conservation and Project Administration, a collaboration with the University of East Anglia, we ask: What are the previous students up to? The 2007-2008 Graduate Diploma Students are all hurtling along their career paths. Martyn Griffiths is General Manager for Frontiers, a charity that specialises in 'adventures in learning' for young people. Natalie Evans is Assistant Procurement Officer for Gloucestershire County Council and Tracie Long is about to start a PGCE in Secondary School Science. "The practical element of the Diploma course taught me so much. I do not feel I would be where I am today without it", says Martyn. This year's students, who graduated in June, are already finding their feet. Jo Keene is volunteering in the Peak District, Fiona Duncan is an Assistant Project Officer for BTCV in Norfolk, and Pedro Mayorga-Jeffs is leading tours in Peru. We are extremely proud of all our Graduate Diploma Students and will shortly be adding a 'Where are they now' page to our website in order to keep up with their career developments.